See the dude laying on the ground for this shot? That’s me! I see alot of people cruising car shows taking pictures… some with gear much nicer than me, and quite a few using their cell phones. What are you doing with those pics? I wanted to cover cool shows like Goodguys Scottsdale with the best pictures I could, so I started watching guys like Paul “Swanee” Swanson take pics and trying to shoot like him. (here’s a few of Swanee’s 2010 Goodguys Pictures from this year) Then, I sought out some other pros and got some tips on Shooting Good Car Pictures. I’m learning! Or maybe it’s just the morning sky! Who cares!! I’m really happy with these pics. 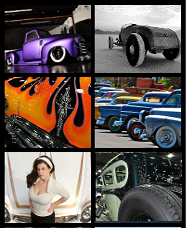 This custom 1951 Chevy Coupe pictures above is owned by Al de la Torre from Scottsdale, AZ. This is the first time this car’s been to a show and these are the first published pictures. I’ve just barely giving you a glimpse of how great looking this car is. Thanks for closing the hood and trunk for me Al! Doesn’t it look like the headlights are on? My wife even liked this picture! Notice the grass? Not sure if Goodguys had anything to do with it, but about 1/4 of the grass at West World has been covered by asphalt and filled with vendors. One of my favorite things about Goodguys Scottsdale is the grass!! It’s high 70’s (cool this year!) and perfect for a sit down or a walk barefoot among the cars. I think the cars for sale at Barret Jackson dictate the new paving? While not a sunrise, the low sun did help set off this color. Finally, I had to snap some closeup shots of the diamond port hole windows in this slick custom van. I hope van’s are making a come back. With the panel painted custom van in the back ground, did I pull this picture from the MyRideisMe.com 70’s photo archive? Any comments? How was the show for you? Bigger, smaller than last year? What was your favorite ride and did we get a picture? There’s three sets of pictures from the 2010 Goodguys Show in Scottsdale. This one, Swanee’s pics and from newcomer Bill Garrett from Garretterokustomphotoandart.com shared some Goodguys Scottsdale Pictures. Nice! Early bird catches the shots that kill. I’m gonna have to get up earlier. —and yes, the grass is great at Good Guys Scottsdale, it looks good and makes it much easier to get low for the shots as you showed here. Nice photos Pike! Love the sky, really sets em off nice! Great pix of Al de la Torre’s 51 Chevy!! !